Law firms able to deliver value make their fees—no matter how high—feel like a deal to the client. 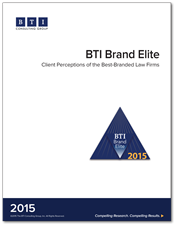 Clients report a 5% drop in the number of law firms adding value to the client experience, as revealed in the just-released BTI Brand Elite 2015: Client Perceptions of the Best-Branded Law Firms. The BTI Consulting Group’s newest in-depth research with 648 corporate counsel at Fortune 1000 and large organizations reveals the 176 law firms with the biggest imprint on corporate counsel in one of the key brand differentiators: driving value for the client. This may be the first sign of legal project management becoming more mainstream. Clients are thinking beyond project tools towards changes in work streams and work processes. The decline in the number of firms recognized for these changes can also be an early indicator of clients increasing their expectations for change at a rate faster than law firms can implement. Law firms bucking this trend include Bryan Cave, which joins the Value Driver Best of Best ranks this year, while BakerHostetler, Bradley Arant Boult Cummings, Carlton Fields Jorden Burt, Dentons, Foley & Lardner, Gibson, Dunn & Crutcher, K&L Gates, Sheppard Mullin Richter & Hampton, Stoll Keenon Ogden and Valorem Law Group join the ranks of the Leading Value Drivers.